Wales has won the bid to host the UK's largest dementia research conference, Alzheimer's Research UK Conference, in March 2020. The event is one of the first to be confirmed at the new ICC Wales, which is set to open its doors in July 2019. The two-day annual national conference will welcome dementia researchers from across the UK and beyond to ICC Wales, where building work began earlier this year. There will be presentations from researchers and clinicians as well as opportunities to network. The conference provides a forum for researchers to hear the latest investigative findings into Alzheimer’s disease and other dementias – from discoveries in the laboratory to clinical perspectives. Ian Edwards, chief executive, ICC Wales, said: "We’re thrilled to be welcoming the Alzheimer's Research UK Conference to ICC Wales in 2020. As a brand new, state-of-the-art convention centre we’ve positioned ourselves as a key venue for major conferences such as this, and our location, size, flexibility and experienced events team all adds to our high profile in the events industry. "With less than two years to go until we open the doors, we are delighted to have another major win under our belt already - a testament to the pioneering vision of ICC Wales." Dr Rosa Sancho, head of research at Alzheimer’s Research UK, said: "With our conference growing year on year we are always seeking out the best venues with dedicated teams to ensure the conference is a huge success. Our first ever conference in 2000 had just 12 delegates, but now we attract around 500 researchers each year and the conference has become a premier event for researchers to share their work. We are excited to bring the conference to Wales and to this fantastic new venue." Once complete, ICC Wales will offer 26,000sqm of floor space for meetings, conferences, exhibitions and events – the equivalent size to almost four international rugby pitches. 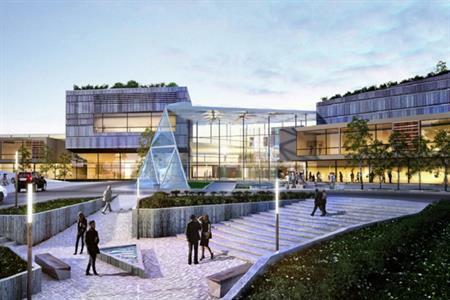 An £83.7m joint venture between Celtic Manor and Welsh Government, it will accommodate 5,000 delegates and will include a 4,000sqm pillar-free main hall, a 1,500-seated auditorium, 12 flexible meeting rooms, a double-height glass atrium and a 2,500sqm outdoor plaza.